Now enjoy 20% off on F&B during your stay at this hotel! Get a free beer or non-alcoholic beverage per guest! Head to Govindham (100% veg restaurant) or Ali Baba Tandoori & Curry Restaurant, both within 2 km of the hotel. Guests can relax at the outdoor pool or get a rejuvenating massage at the on-site spa. Located on Pattaya road in Chon Buri province, Four Seasons Place Hotel is a 45 minute drive from U-Tapao-Rayong-Pataya International Airport. The renowned Ripley's Believe It or not Museum, Tiffany Show and Art in Paradise are within a 10-minute drive of the hotel. Offering eclectic views of city and pool, the 70 well-appointed suites feature parquet flooring and classic decor. In-room amenities include flat-screen satellite TV, mini bar, oven, microwave, electronic safe, DVD player, coffee/tea maker and free Wi-Fi access. Indulgent massages and beauty treatments can be availed at Gaia Spa that also features a sauna and steam room for complete relaxation. Take a relieving dip in the outdoor pool, after a workout session at the on-site gym. Complimentary drop-off tuk-tuk shuttle service is provided by the property to explore the nearby area in a convenient way. Other offerings include airport transfers (paid), meeting facilities, car hire and high-speed Wi-Fi access. The in-house Season's Cafe serves scrumptious European and Thai delights with hot/cold beverages. Also, guests can enjoy refreshing coffees, cocktails, beers and wines at Harlem Bar on site. Specialising in Indian food, Ali Baba Tandoori and Curry Restaurant and Haveli Indian Restaurant are a 5 minute drive from the property. Besides, McDonald's Restaurant is a 10-minute drive from the property. Shopaholics can explore CentralFestival Pattaya Beach Mall, barely a 7-minute drive away. Check in time from 14.00 hrs Check out time 12.00 hrs. Value for money Very good staff good rooms Can cook home made food Only disadvantage was it's 2lm from walking street. It was value for money I visit there and they gives early check in and welcome drink staff very respectable breakfast was super fine and hotel have car you can take drop in pattaya attractions free it was good stay room is also spacious. They want to charge extra for extra towel, blanket, water. We went in for the breakfast. Horrible tasting food, no choice for indians. Fantastic Place! The prices are not expensive. Please note that this is not owned by the Four Seasons Hotel group, but this Place is luxurious and well Worth every penny. The rooms are big and spacious and have all the amenities you need. The staff is very courteous and friendly. They have their own shuttle which drops you off to nearby places for free. The guy driving the shuttle, Tono, was extremely friendly and helpful to us. The food options are good and they have their own massage service and gym. We did not avail any of those services though. The Place is close to the City centre, Beach and walking street. I definitely recommend this Place for anyone who wants a pleasant stay at Pattaya. You will not be disappointed. We reported at 2 pm but rooms were not ready, given 1 room after one hour's waiting. Surprisingly they asked for a big amount as security deposit without any prior intimation, they don't have faith on their guests and ask for security deposit to recover any unexpected losses. They are so called 4 star hotel but they don't have facility to take payment through credit card, they asked for the hard cash only. They also advised that If you report late after working hours, you will have to wait till morning to staff come and give you check in. Overall it's like small town lodge without any courtesy to the guest who are in the travel since last 15 hours. I don't recommend anybody to stay with them. Food not good room is good or reception staff cooperative. Bathroom small or not maintained. A very mesmerizing place to be. Which leaves you totally fascinated from the time u step in. A fully equipped kitchen. Posh bathroom. Living area n a lounge. And a very beautiful bedroom. Planned and designed with a greek theme. Location good for family. Okay for young once. The hotel is good. Staff is helpful. Have to go with time. The rooms we had were not cleaned, beds not made. No clean towels or water provided after the first day. We had to request for them. After the first day, the TV didn't work. One of the rooms didn't have hot water. Not clean. And in 4 days housekeeping came only once. Clean towels and water was given only after requesting. Nice hotel. But compare with another hotel so may be you get good hotel with your things. Old property. Needs a lot of up keep up and staff to be trained to speak politely and especially in english. The property and rooms aren't well maintained. The toilet fast was broken, the rooms wasn't clean when we arrived, the staff at the reception was rude. Especially the guy who checked us out. He lied to us about the free shuttle drop. Good stay. Felt very royal. Great hotel stay, excellent rooms, all cleaned and superb decorated. Value for money, great hotel, I ever stayed. Some unpleasant smell in the room. Breakfast is ok. Not much choices for vegetarian. Four Seasons from the looks of it is a great choice for a family or friends vacation. Here are some pros and cons that you want to consider. Pros: 1. Amazing luxurious rooms or rather "Suites". All facilities are there inside and it's super comfortable with balcony views as well. It can't get any better than this anywhere else for this price. 2. Free shuttle service to walking street, bus station anytime you need (though you have to come back on your own). 3. It has a nice swimming pool and gym. 4. Breakfast had a decent variety of both veg and non veg. Veg had about 3 items but it was really good. The chef and F&B people were very friendly, suggested a lot of options as well. 5. Free complimentary drink (beer/juice/coffee) per stay. 6. Car/bike rental shop right outside Four Seasons Place Hotel. Cons: 1. Location is around 1. 5 km from Pattaya beach, where all activities are located. Yes the complimentary shuttle is available but it costs a bit to come back on your own. But again if you're renting a bike it will not matter at all. 2. The front office staff, especially the one in the morning is very rude and rigid. Not flexible even a bit. Didn't even smile once or friendly. So found that to be a disappointing thing. Being an Indian, I clearly felt a racist attitude against me. (A few other people standing nearby in the reception came up to me and said the exact thing). 3. Most Four Seasons Place Hotels allow a complimentary early check-in at least to some extent. I arrived post 9 and yet I was charged half day charges of around Rs. 2400 for just those 3 hours. That was a bit downside for me, given that I was going to do an early checkout as well. We booked a Double Bed Room Suite and a Junior Suite. Both are awesome. Food is good but not much dishes for vegetarians. Didn't liked the Thai food much. Location is a drawback as it is far from beach road. We need to hire a motorbike taxi for approx 40-50 baht per trip. Guest friendly Four Seasons Place Hotel and the swimming pool is nice and clean. Overall liked the stay in Pattaya. Currency conversions at airports are costly. Change a small amount of money (min. 2000 baht) at airport for Visa, SIM card, food and taxi to Four Seasons Place Hotel. Then use your debit cards to get thai currency as it is much cheaper than what they charge in currency exchange. It's better to change currency at home airports as they are costlier in thai airports. I booked by makemytrip for three night. I check in early morning & front office staff very supportive, with in 10 min. Arrange the my room. Hotel location walk in near by 2. 5 km. Near by so many indian restaurant. Hotel car drop to the nearby area any time free of cost. Rooms & breakfast excellent. My wife feel excellent stay. I suggest to the Four Seasons Place Hotel, area for reception, lobby, rooms corridor & restaurant light music required. Check in time Four Seasons Place Hotel very silent. Wi-fi connectivity required strong. In case Four Seasons Place Hotel arrange good indian food. Hopefully guest are more comfort. Over all 4. 5 rating to the Four Seasons Place Hotel. I had booked a One bed room suite with breakfast. The room was too good. It was so spacious and was having all amenities like Fridge, Owen, Stove to prepare food, selected crockeries with central AC. Breakfast was unlimited buffet with decent menu. Pool is also good. And Four Seasons Place Hotel is located in center of Pattaya. You can go by walk around to see main attractions. It was more than expected and we were too happy seeing the room. The only disappointment was even after informing to Four Seasons Place Hotel staff for early check-in they were unable to accommodate us. We had to wait till 1Pm to get the room. Rest everything was good. The Four Seasons Place Hotel is very close to where the action is. Yet, it's a quiet place where you can relax and have a piece of mind. Receptionist(s) are very friendly. Got a complimentary drink coupon. Free Wi-Fi. Season's Cafe served excellent food and friendly people to serve. Swimming Pool, Gym, Spa and more. It's also a guest friendly Four Seasons Place Hotel. You also get free drop to the nearby locations that you want to visit. Overall, the experience was very satisfying. Would recommend my friends to stay at this Four Seasons Place Hotel. We (me and my wife ) stayed here for 3 days. Their 1 bed room suite is excellent with good views from the balcony. Good service, the staff were very polite and helpful. But as with most Thai Four Seasons Place Hotels, the staff do struggle a bit with English, but otherwise it is very good. Their restaurant serves a good variety of dishes especially at breakfast. If you like walking, the Four Seasons Place Hotel is very close to all major pattaya attractions. Motorcycle taxis and cars are available just outside the Four Seasons Place Hotel. I got a great deal on the Four Seasons Place Hotel price which made my stay there even more satisfying. The room has contemporary decor. There's a kitchenette as soon as you enter, followed by a living room area which has a TV & Sofa. The bedroom is quite spacious and has a balcony overlooking the city. If you are planning on a longer duration stay, the Four Seasons Place Hotel also offers a gym, free wifi & a swimming pool. Location wise, it's slightly away from Walking Street. But you can get taxis or rent a bike. Hotel is good value for money (Paisa Vasool) Location good if you are willing 2 compensate with view, also provides free drop ONLY @ many places. - Rooms are suite & with balcony -mini kitchen. - Food is good for vegetarian available in chinese, Thai & Italian menu ordered @ room service & tariff of Dinner/Lunch for 2 @ INR 1500 max - Breakfast for veg people not good - swimming pool, spa, gym all available & descent. - Service is quick & Staff are courteous. - 20 second walk from 7 Eleven. Hotel is at just 15 minute walking distance from walking street. Rooms were very good, clean & have all the facilities like locker, fridge, kitchen, sofa set, tv, hot water etc. The plus point is Free shuttle drop service. I only stayed there for one day but they drop us at walking street at first night & northern road bus station next day morning for free. Check in process is easy & the behavior of staff was also good. They also offer free welcome drink. Overall good experience. Stayed for 2 nights and 3days in the 2 bedroom suite with my family of 4. Had a wonderful time. Clean, fully furnished, very spacious, excellent staff, very good breakfast. It also has a very good gym and a massage spa. In close proximity to Pattaya beach, Art in paradise, Thepressit market malls etc. Seven Eleven shop and many Thai eateries are just outside the Four Seasons Place Hotel. In all a very good experience and shall suggest this property to my friends. Only old construction and internet connection was very poor. The suite room is absolutely amazing. Well-maintained, not much of a view apart from the pool but everything else was superb. Breakfast was very nice and staff was helpful. 15 min walk from the beach and shopping locations. Would recommend for a group, family or couple travelers. Good pricing. Modern and decent Four Seasons Place Hotel. Clean property and great ambiance. Well maintained and not clustered. Airy romantic, approachable. Amenities and restaurants nearby. If you do not wish to spend a bomb of money on unnecessary things in a Four Seasons Place Hotel, just opt for it. Four seasons place is very good Four Seasons Place Hotel to stay. Location of the Four Seasons Place Hotel is good and well connected with all major place. Hotel provides free drop to near by places to the customers. No Indian food. Value for money. Staff cooperation is also very good. It's a good Four Seasons Place Hotel located at a good location. Excellent stay, fantastic room and even they give drop to market for shopping, etc. But you have to reach back to Four Seasons Place Hotel on your own. Recommended. Would stay again if get a chance. Absolute value for money. Good food. Excellent front desk staff. Their spa is not great at all. Worldride, One of the best experience of my life. Hi I Yogi from India. I traveled almost every part of the world. But this is my one of best experience. Food quality, Staff, cleanliness & service is amazing. Pool location is really cool. Nobody can't disturbed you. Very nice Four Seasons Place Hotel. Friendly staff. Neat and clean rooms. Rooms are big with nice decor and beautiful furniture inside. Kitchen facility also provided I the room. Location is also very to good. Free drop facility provided by the Four Seasons Place Hotel. Good Four Seasons Place Hotel to stay in. But found the front desk staff rigid on issues such as early check-in and extending complementary drink for each multiple booking. Also housekeeping needed reminders for placing toothpaste, shaving kit, etc. Also towels were not replaced and needed reminders. Hot water supply was erratic. Everything was OK. Though just need improvement in breakfast for vegetarian. Hotel is very good. Junior suit is very big and clean. Nice location. Famous Pattaya beach is 2 km from Four Seasons Place Hotel. It was a nice stay. Location is in central Pattaya and no noise is there. The have only suites room or I can say it is like a studio apartment. All the room is well decorated and spacious with modern amenities. Food is excellent. All the staff of the Four Seasons Place Hotel is very polite and courtiers. I will suggest everybody for this Four Seasons Place Hotel. Perfect location neither too close nor too far if you want to go for a beach walk or want to go to walking street for nightlife experience. They provide you a drop to your location at anytime. General stores are near by for your daily requirements. Staff is friendly and all in house facilities are available. 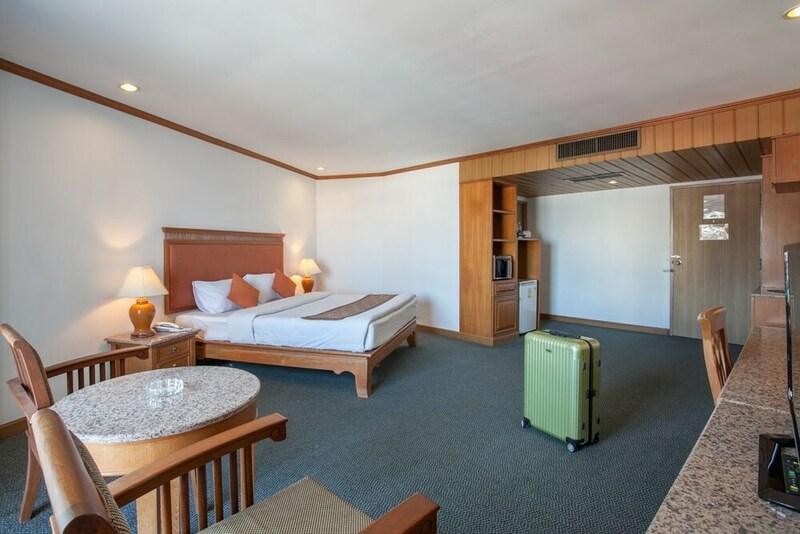 Nice clean and spacious rooms for a comfortable stay. Absolutely value for money. The room was excellent and good staff and quite location, good view from room with balcony attached, they have a complimentary drop facility to walking street, the buffet breakfast was good with good taste. We stayed there for 2 days on 6th and 7th november 2016, it's an amazing experience. It's is little away from beach road but taken care by the free shuttle service. Junior suite room is large and spacious. The kitchen was too good, we celebrated our anniversary by cooking indian food... Awesome experience. Big C is 1o min away... Lot of pubs and massage parlours down the road.